The fjords and small fishing villages of the east coast were calling, following our adventures along the southern coast of Iceland. At the beginning of our third day on our drive around Iceland’s Ring Road, we couldn’t believe how much we’d already seen. The kilometres were low today (about 250 km), but some of the driving proved to be a bit more rugged than the previous days. The eastern fjords are a key attraction on this side of the country. Similar to the western coastline, the shoreline here is a mass of peninsulas jutting out into the ocean and forming fjords in between. To get into many of these fjord areas, you must divert off the Ring Road, and onto the smaller roads. Doing this will add time to your journey as the roads are often of a lesser quality than the main route. The reward for doing so, however, will be seeing the beauty of these small towns that would otherwise be missed. With so many harbours in these fjord areas, it became a natural fit for the fishing industry to set up along the coast. 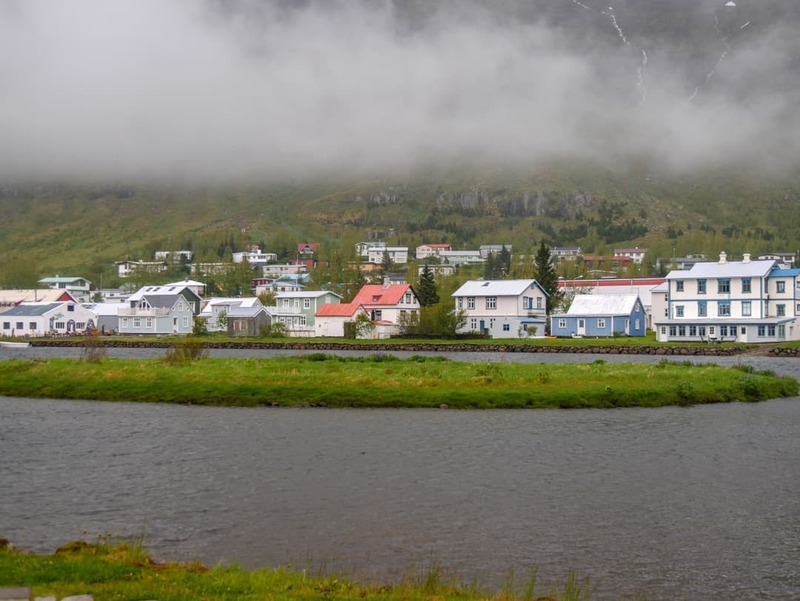 With approximately 2,200 inhabitants, Höfn feels like a large town. It is, when you consider most of the small towns we’ve driven through have very low populations, some are barely populated at all. Höfn is a fishing village and has grown from its early origins as a result of expanding the seafood it catches. Now known as the lobster capital of Iceland, it brings in Norwegian and Icelandic lobster along with their fish catch. With the colourful boats sitting on the harbour, all under the watchful eye of the Vatnajökull Glacier is it any wonder this is a must-see town. It has several restaurants and small museums where you can absorb some of the local history. Dating back to the 1500s, Djúpivogur is another cute fishing village, home to only around 220 people. The house below is Langabúð, one of the oldest trading houses in the town. This building, dating back to 1790. now houses a folk museum, art museum and a cafe. As we continued in a northerly direction, the icy landscapes gave way to strange looking mountains. With green vegetation growing up the sides, they stop at a point, keeping the tops of these mountains undressed and bare. There’s not a tree to be seen anywhere around here. Iceland is full of waterfalls. Whilst there are plenty on the southern coast, especially in the Golden Circle, they can be found almost everywhere else too. 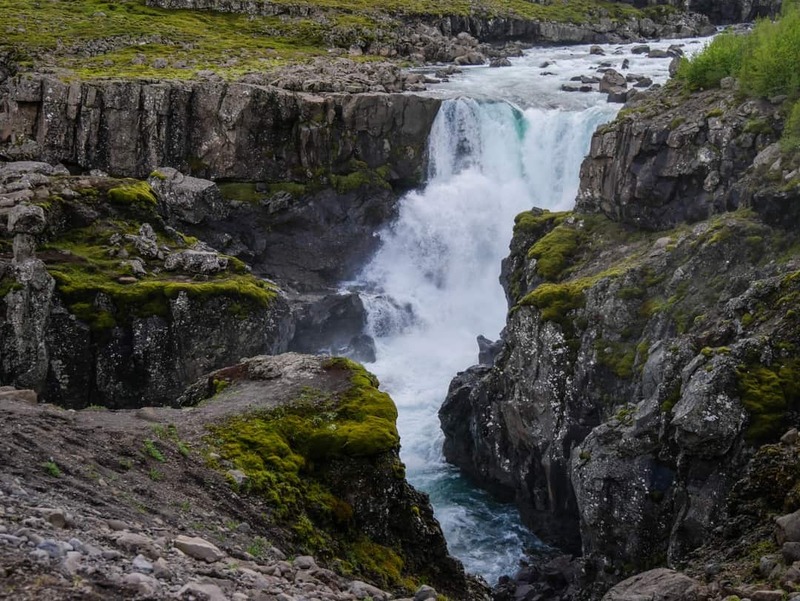 Sometimes, a hike is needed to get to them as they are located further inland, but many, like the Fossardalur waterfall, are only metres off the side of the Ring Road. Having our own vehicle means we are free to stop at places like these whenever we want to. There were some days I felt like I was constantly getting in and out of the campervan. There’s an area to park and you can walk right out to the edge to get a great view. The real beauty of this 122-metre high waterfall is the bright blue waters of the lagoon it empties into below. Lagarfljot, a large lake in the east of Iceland has a connection with a similarly large lake in Scotland. Since the 14th century, legend has it that a giant serpentine has made itself a home in this 38-kilometre long lake. With its water originating from the Vatnajökull Glacier, it is the centrepiece of an extraordinary part of the countryside, well-known for hiking and other outdoor adventure activities. Being so close to the glacier, it also goes without saying that there are many more waterfalls around too. It’s a pleasant drive up and around the lake and offers so many opportunities to just take in the ever-changing landscapes. Egilsstadir and its neighbouring town of Fellabaer found across the Lagarfljot River are two of the larger towns in this area, and have formed the base of the trade hub here. If you are driving this is a perfect time to stop and stock up on food and fuel as many of the basic services are available here. It is also the gateway to the fjord town of Seydisfjordur, our next stop. If it wasn’t for the terrible one road in, one road out experience, this town would be inundated with people all the time. In one way, that’s great as it keeps the numbers down, but even me, who is used to driving some very difficult roads, was ready to tap out on this one. No doubt, it had everything to do with us driving through the mountains during a total white-out. Given that this happened in summer, I would truly hate to witness it in winter. If nothing else, it gives you a chance to test out your Iceland driving skills. Seyðisfjörður is a beautiful town located right out on the eastern coast, on a fjord of the same name. In the mid-1800’s it became known as a trading centre, and many Norwegian fishermen came to call this their home. During World War Two, the town also became a base for the Allies. A large industrial port also sees ferries come across the ocean from Europe during summer. If you are planning on bringing your own motorhome, this is the port in which you do so. Whilst the cloud up on the mountain didn’t amuse me much, once we were down in the town, my thoughts switched from it being treacherous to more aligned with a fairytale. Here, those clouds that made it impossible to see up there, now descended on this town enveloping it in its soft, fluffy arms. There is an official campground here but we also found ourselves a signed camping park just out of town and within walking distance of the main centre. The street on the other side of the cafe is the best in town, with bright stripes on the cobbled roadway leading down to the sky-blue church. Known simply as the “Blue Church”, this building has been more mobile than any other church I know of. Starting its life on a farm, it was later moved to another area in 1882. In 1894 however, it was blown down from its hilltop position by a storm and was relocated once more to lower ground. It remained there until 1920 when it was removed once again, and repositioned in Seyðisfjörður. Even here it wasn’t safe, with fire ripping through parts of the church in 1989. Today, it stands strong in the centre of town and is easily the most beautiful building here. There are many points of interest in this eastern region. The best way to see them is to self-drive and take it slow.